Mike's puzzle was originally the finals puzzle at the Lollapuzzoola tournament a couple weeks ago. I test-solved it aboard an airplane, untimed because my only watch is my cell phone and phones must be turned off during flight. Brian Cimmet, the cohost of Lollapuzzoola, was looking for a tough finals puzzle, so I suggested a few spots that might need toughening up. 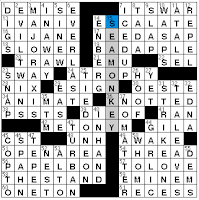 Aw, I'm disappointed that the genus and species of brine shrimp (Artemia salina) didn't make it into the SEA MONKEY clue, per my suggestion. (15D: [Pet for which you can buy an Aqua-Leash] is harder than the original, at least.) I haven't compared the Lolla final version with the NYT version, so I don't know if there were (m)any changes. I wouldn't have used the "play against the clock" option on the applet if I'd remembered that the puzzle was one I'd seen before, but the margaritas, they kept me from remembering. Ah, well. Still, Mike's fill and clues were worth another go-round. 16A. G.I. JANE is the [1997 Demi Moore movie with the tagline "Failure is not an option"]. Further pop cultural yumminess is embodied in Stephen King's THE STAND and Oscar-winning rapper EMINEM. Oh, and EDNA Garrett of The Facts of Life, [Housemother to Tootie, Natalie, Blair and Jo]. Which Facts of Life girl did you most identify with? I kinda wanted to be a Jo. 42A. ["The press," for "reporters," e.g.] is a METONYM. So is "the crown" when used in lieu of "the queen." 2D. EVIL TWINS are [Bad copies?]. The host of the erstwhile game show Merv Griffin's Crosswords, Ty Treadway, previously portrayed an evil twin and his less-evil brother on One Life to Live. 11D. ["Gigantic (___ of Two Johns)," 2002 documentary about They Might Be Giants] clues A TALE. If you like goofball wordplay but aren't familiar with They Might Be Giants' music, wander around the the two Johns' website and have a listen. And if you have young kids, get the album No! "—it's delightful for the whole wordy family. 37D. "NO MATTER" is clued as ["Whatever"]. 44D. GARLIC is the [Food used as an antiseptic during World War I]. Crazy trivia! My late grandma attributed a major drop in her cholesterol level to her habit of drinking warm milk at bedtime—with a sliced clove of garlic in it. True story. I've yet to meet anyone willing to try out the garlic milk. 20A. SPENT CARTRIDGE [Firing range remnant]. Didja notice that this combo seems to set up a mini-theme all of its own? There's also GUN [Saturday night special], AMMO [Arsenal supply] and even ARMS. Okay, I know, that's been slyly clued as [Half of all fours? ]—but you get my drift. I was even taken in by [Reasons for shootouts in the NHL]. Wow. I mean I know hockey has a reputation for stirring up belligerent feelings among the players, but shootouts? On the rink? Nevermind. The answer relates to scores, or more specifically, games that are TIES. 37A. TIRED EXPRESSION [Cliché]. Hmm. Would that be anything like ["What goes up must come down," e.g.]? Today those words represent an AXIOM. But let's face it—many's the time those axioms are cliché, so the answer appears to be "yes." 48A. BEAT GENERATION [Jack Kerouac, Allen Ginsberg, and others]. This is my fave of the theme fill. If you're not familiar with the writers of this '50s cultural movement, do take a moment to fill yourself in some. As the article points out, it was the Beat Generation and beatniks who paved the way for the hippie counterculture of the '60s. And who was one of the great singer-songwriters of that generation? Jimi Hendrix, who gets a double shout-out today with fill-in-the-blank clues for "Purple HAZE" and (one of my all time faves) "All ALONG the Watchtower." Seriously cool stuff. Lotta names in the mix today. The gents are: (H.) ROSS Perot, Nicola TESLA, RON Howard, Don IMUS, PETER Ueberroth, Ernest or Julio GALLO and Patrick EWING; the ladies: EDIE Falco, ANNE Hathaway, AMY Adams and ["Cheers" barmaid], the snarky and super CARLA Tortelli. Other strong fill would include: RANCOR; TAPIRS, those unusual-looking [South American mammals] (that are darned cute in the baby-stage); EXUDE and OXIDE; CURFEW and CUT MAN [Figure in a boxing ring]. That last one conjures up Clint Eastwood ("the best cut man in the business"), Morgan Freeman and Hillary Swank in the rip-yer-heart-out Million Dollar Baby. 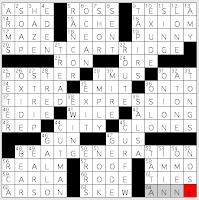 I enjoy conversational phrases dropped into a crossword grid. Doug gives us two, both super informal: 23A: "Care to make it interesting?" ("WANNA BET?") and 56A: "See ya!" ("I'M OUTA HERE!"). I prefer the two-T outta spelling, but my dictionary lists both spellings. I'm a fan or the first/last name combo in crosswords, too. Usually AMIS is clued by way of author Kingsley Amis or his son Martin Amis, but MARTIN AMIS (60A: "London Fields" novelist) looks cooler. I haven't read either Amis. 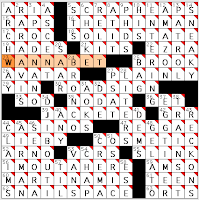 3D: Successor to the mini (IPOD NANO)—boy, crossword makers lucked out when Apple chose the iPod name. Alternating vowels and consonants, plus it's livelier than the other I*O* options, like IRON, IROC, IDOL, ICON, or IPOS. I'm a bit of a geography nerd, so I appreciate fill like 34D: Horn of Africa country (DJIBOUTI). Plus: That country, which is near Ethiopia and Somalia, practically rhymes with "shake your booty." 53D: Movers, but hopefully not shakers (VANS). You don't want a moving VAN to shake your boxes of fine china. Hey, I never knew this: 48D: Italian for "frozen" is GELATO. Gelid is a high-end vocabulary word meaning "icy" that's related. Opera fans may recognize the La Boheme aria "Che gelida manina," which is about Mimi's cold hands. (Why has no one written a song about my cold hands?) Despite GELATO and gelatin looking so similar, apparently the latter derives from a Latin word for "jelly." If you like to compare your solving times with mine, boy, you're fresh out of luck today. Maybe tomorrow! The last corner I was able to work through was the northwest one. The three toughest clues for me in that quadrant were [Powerless people of fiction] for MUGGLES, the non-wizard people in the Harry Potter universe); [Knighted actor] Peter USTINOV, who does not have a very British Isles surname, so he was a surprise there; and [Name meaning "I am faithful"], which brought people name FIDEL to mind but not dog name FIDO, the answer. The upper right corner is topped by QADHAFI, the [African Union chairman elected in 2009], the guy whose name can be transliterated in about 10 different spellings. He's above "YA THINK? "—a [Jocular "Really?"]. Moving towards the puzzle's midsection, we hit BOO BIRD, or [No fan of the home team]. Who uses that term? Dropping down to the lower left, LEN is a [Spy novelist's prename]. Len...Len...Deighton? Yeah, that's the guy. I started with IAN Fleming. I didn't know that it was the YEW TREE that was [Wordsworth's "pride of Lorton Vale"]. Oak, elm, ash...so many trees to choose from. In the final quadrant, I started with FATCATS instead of TOMCATS for [Garfield et al.]. [Like moles] uses the two-syllable mole, the MEXICAN sauce made with chocolate. P.W. BOTHA, that unsavory [ANC opponent] who ruled South Africa as a staunch proponent of apartheid, balances QADHAFI's North Africa geographically.